I’m pretty sure it’s been grey since November now, and I would just about take anything in the sky over the constant gloomy reminder that it is no longer summer – anything perhaps except blood. However, that’s exactly what appeared to happen one night in 1841. On August 17, 1841 slaves working on Mr. Chandler’s tobacco farm in Lebanon, TN reported that a red cloud floated overhead and drops of blood and flesh poured down from the cloud. It was undeniable that there were bits of fat and blood around the property causing a Dr. Troost to visit the property, after which he reported his findings in the American Journal of Science. 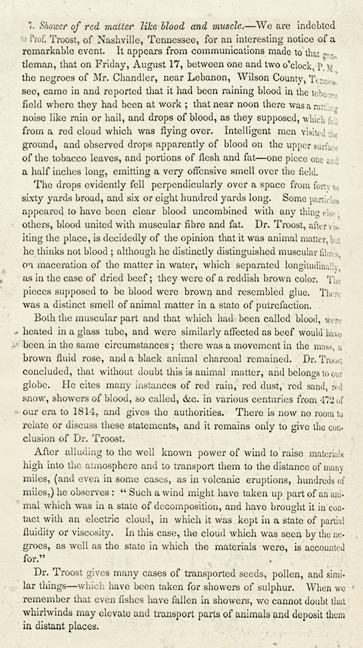 He hypothesized that a powerful wind “might have taken up part of an animal which was in a state of decomposition, and have brought it in contact with an electric cloud (http://www.tennessee.gov/tsla/exhibits/myth/mythcellaneous.htm).